That's a very fair review Katherine. 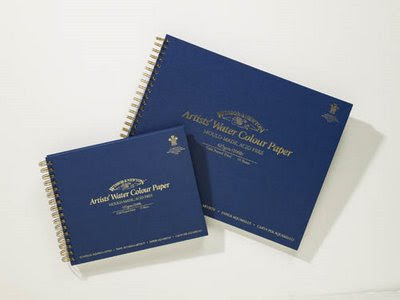 I'm a very big fan of Winsor & Newton paper, they always provide good quality paper and sketchbooks, although I have to say, I have found the distribution a bit strange too. It seems to take a very long time for them to get the (faux) leather journal out and I remember it being near impossible to find it on the internet. I had to take photos of mine to show those interested in it! I wonder how their distribution works? I wonder too if Caran d'Ache would listen to a plea to extend the colours in their 'Museum' range?! Well done for tracking down some suppliers Katherine - I tried as I was interested to know how much these books retail for, but couln't find them listed anywhere. I also hadn't realised your point about the paper - I certainly would have expected it to be top quality. However, I am not complaining, it was a freebie after all! lots of very useful information here and I'll remember that when i go buy more supplies. At this time I'm using the watercolor pads which are limiting in the since that I only have one sheet available at a time, so a full on watercolor sketchpad would be nice to look at. I have made my own up, which is fun because I added other kinds of paper as well for just sketching or even writing. Love all the useful hints and tips for sketching and painting plein air, which I have just started doing. ps. it is very true about companies wanting customer feed back. My father wrote a company of hunting knives with a lifetime guarantee even against loss and sure enough they sent him a new one. I've been using the luxury pads, and at first I didn't like the paper, it seemed a little soft and under sized, but once used to it I rather liked the quality it gave. Very good for granulation effects and lifting out but not as good for scrubbing out and very crisp detailed work. I usually use Arches but I've found the paper in the pads better in use than I expected.